Every night I go to bed thinking, tonight's the night. Every morning I wake up disappointed. Where is my baby, I ask. I search the bedding. Why won't it come already? Mice problem seems to be eliminated. We ended up with a total of 17 or 18, unsure. Josh's mouse highlight: When he was down working in the office after midnight and one ran across the floor. He and Zeke the Chihuahua manage to corner it. Then called me on his cell phone, woke me up to come help. Josh's questions were, "Will it bite me?" Yes it probably will. "Will it's tail fall off, if I pick it up by it?" No I don't think so. Can I go back to bed? He got it in an OJ container and was traumatized for life. My mouse highlight: Was when I checked the traps, we had the snap down and break the neck traps. Finding one live mouse on the sticky trap was enough trauma for us. Any way I found TWO caught in one trap. How does that happen? They both had to be in the exact same wrong place at the exact same wrong time. I took a picture for Josh, but will spare you. 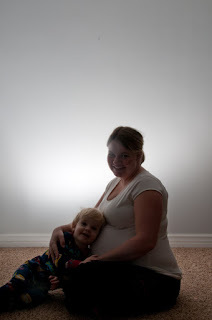 Josh took some profile pictures of my big Budha belly. He wants to edit them, but it is taking to long and I want to post them. So that's all the crazy for today, but as I sit and wait I may come up with more crazy ideas, so watch out. I went to my new Doctor today. I loved him, it was a great experience! Also we were a little unaware of the problems associated with a vaginal delivery after cesarean, so might be re thinking our plan. I am terrified to be away from Aiden that long and since children are not allowed to visit hospitals these days, I'm not sure what the plan is. But luckily (sarcasm) we have time to figure it out. We are officially now grown ups. A couple months ago Josh told me we had a mouse. I totally freaked out! Then I started hearing it late at night as well. Josh thought it was in our ventilation system. But I heard it in the kitchen. Like under the dishwasher. Josh cleaned out the cupboards, no sign of Mr. Mouse. No chewed boxes, no mouse droppings. I bought the sticky kind of mouse traps. Poison wasn't an option, it would eat it and go die in my walls, stinky! The traditional mouse traps would have Aiden in the hospital with broken fingers. Now we just had to figure out where this mouse was so we could set the traps. Well honeslty I haven't heard or thought of the mouse in about a month. But last night as we were cleaning up the kitchen, I was finally throwing out the pile of Christmas treats and picked up the pile of Kit Kat bars and they all had little chew marks in them. Ah ha, we got him. But I was still confused as to why there were no droppings on my counter, he had to have spent quite a lot of time up there eating those Kit Kat bars. Well out came the sticky traps. They surrounded the Kit Kats. I hated this mouse, I was so ready to get him. Not in my house Mr. mouse! Josh was giving me all my medicines before bed last night. Aiden said, "can I have some medicine?" To which Josh replied. "You can have medicine when you are pregnant with a baby." Aiden said "ok" very enthusiastically. I had my doctors appointment today. I have been indifferent towards my doctor this entire pregnancy. But today I decided I REALLY don't like her and don't want her to deliver my baby. Mostly I don't want her to get my money. So here I sit almost 35 weeks pregnant and looking for a new doctor. I LOVED my last doctor, I LOVED the hospital, I LOVED the experience. If we had the money, I would have flown back to Maryland to have this one. Anyway, baby is much lower. I'm dilated to a ONE, big news I know. And 60% effaced. Which I kinda knew cuz I feel like this baby is trying to get out. It is sooo low! I am a very private person. I like to keep things intimate. That is why Josh and I were married all by ourselves, with no spectators. It was easy with Aiden's birth because we were out of state. I want to rest and bond with my baby and I really don't like people coming by. Josh has vetoed part of this and allowed for Grandparents only, but by appointment. NOBODY is allowed to just stop by. I have no problem telling people to leave:) If you are a grandparent please call and ask me (not Josh) when is good. The baby won't change much in a few days. You can see it when we get home. But when we are home, it will probably be by appointment as well. I am not the kind of person who likes people just stopping by. Also I am a complete germaphobe, so no kids at first or any slight sign of sickness. Hate me if you want, but my baby, my rules! Also we will be charging some kind of service, meals, cleaning or gifts as admission to meet our wonderful child. Josh just made pancakes for dinner. He tried a new recipe. They tasted alright but it was definitely a different taste. Halfway through my second pancake I found a small white circle. I thought maybe a lump of flour. I said, "Josh what is this?" He said it was "just an ingredient". So I pressed him and it was cottage cheese. What kind of recipe for pancakes calls for cottage cheese? Apparently they exist. However the recipe he used did NOT call for cottage cheese it was a substitution. "For What?" Both you and I ask. For sour cream. That's right folks, you can substitute cottage cheese for sour cream. At least in Josh's world. Either way, I am so nauseous lately that, the idea of cottage cheese in my pancake did me in. Today we had are first Sunday in our new ward. You see our old ward got divided and we got stuck in the new one. At first I was excited because we actually got to sit on a nice soft bench instead of a cold metal hard folding chair way in the back. Well today I would have given anything to be in the very back. My lovely son is a difficult child. He really can be. Our new ward doesn't seem to have a s many small children, or as many people in general so it is much quieter. All during church Josh and I were on edge because Aiden was loud and he seemed to be the only person in the building being loud. After the Sacrament was passed, the bishop said "Thank you for being reverent that was almost as quiet as the Singles Ward". And I imagined in his head he followed with "except the kid in green." Now as the end approached, as all small children tend to do, Aiden was losing his patience with being stuck there. He got in trouble and Daddy picked him up to carry him out. On his way out, through the cries, he yelled out "Help Me Mommy!" The ENTIRE congregation started laughing and looking to me. Even the girl speaking stopped speaking and started laughing. Church stood still for Aiden. I wanted to duck, to cry, I couldn't laugh, that was my son and literally church just stopped for him. I just stared straight forward and held back the tears until people could stop laughing and get back to speaking and listening. We made a wonderful first impression today. Lots of people talked to us after about how "cute" Aiden is. That is NOT the word I use to describe him. I haven't gotten the pictures from Josh's camera, so there could be a follow up post. First there was cookie making. The Aune Family makes a ridiculous amount of cookies every year. Between 150-200 dozen. That is between 1800 and 2400 cookies!!! 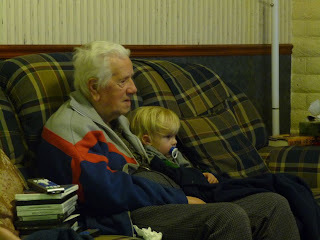 We were there late one night and put a movie on for Aiden. Aiden can't do anything by himself, including watching a movie. So Josh got Farfar to watch it with him. I know Aiden loved it, because Farfar talked to him the whole movie and asked him questions about it. Then there is the Aune Family Christmas Eve. This is big tradition in their family. This year we got to wear our Norweigen sweaters, which is something everybody does, if they have them. Here is Aiden and Farfar in their Norweigen sweaters. 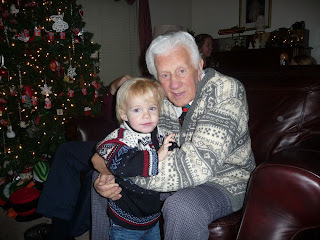 I love these pictures because Farfar is 89 years old and I keep saying this could be his last Christmas, but the truth is he will probably outlast me. Aiden looks like a girl, but I did get his hair cut last week, so he is less girlish. Another interesting tidbit you should know about Farfar. He is like a little kid. He is always poking and tripping Aiden with his cane. I finally told on him to Josh, and Josh said, "What else are you going to do when you're that old." So we let the behavior continue and it doesn't bug Aiden too much. Every year at Christmas eve they dress up the kids in the Nativity scene. Well a couple years back the family divided because it was getting too big. 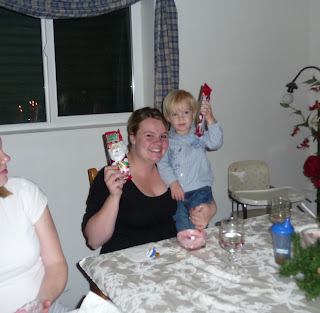 This year, Aiden was the only little kid, so I got to pick his part. 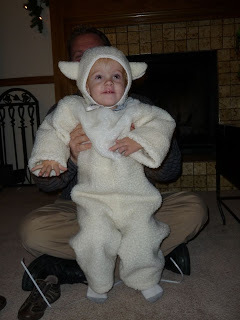 I have seen this scene for many years and have always wanted Aiden to be the sheep. This year the role was all his. Of course the most important role that Christmas was the sheep, right? And lastly, they have a tradition Norweigen dessert, rice cream, that they hide almonds in. If you find the almond in your dessert, you get a chocolate Santa. Now every year I have gotten it. It's like a 4 out of 30 chance. EVERY YEAR, well except the year I didn't go, but Josh got 2 that year, so we count it. This year before we even got there I was feeling enormous pressure! I thought how can I keep this up, but I REALLY wanted to. So I served myself. Josh served Aiden and I saw one plop into Aiden's bowl. Josh knew how important this was to me so he told me to take it. Well its not the same if you cheat. Oh boy was I sad, I knew if Aiden had 1 there were only 3 left. Then Kimball immediately got one and 2 minutes later he had another. I was devastated. I had swirled and dug around my entire bowl trying to find it. So I just started eating. Horribly sad. Then, near the bottom, almost done, there it was, my little Christmas miracle. I was so excited. I cannot even tell you how excited. I squealed with delight. Honestly had to hold back tears because I had wanted it so bad and was so certain I wouldn't find it. Lame I know, but I could have cried at that moment. Next year is going to be even harder, or I won't have pregnancy hormones so I won't care as much.